I used to love taking part in writing prompt linkies and recently I have done a few instagram ones. I love how every person takes a different approach and is inspired to create. I wanted to something similar but different. 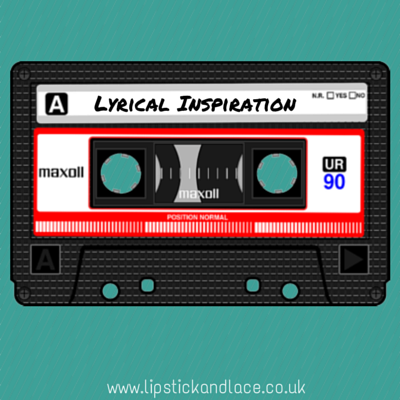 I give you Lyrical Inspiration! Each month I was give you a prompt to inspire you to be creative in any form you like. You can write a story, poem, song, do a drawing, take a picture, sew, knit, make a video..... the possibilities are endless. The prompts will be song tittles or lyrics. I will share my creation and there will be a linky that you can add your link to whether its a instagram pic, blog post or video. You don't have to add it just use #LyricalInspiration on instagram or twitter so I can share it. I will be setting up a Pinterest board if you want to join it just let me know your profile name or leave a link. So the first prompt, I had been racking my brain and then it hit me Monday night while I was at a gig. It was the very last song and I thought it would be perfect. Have a good think and see what you can come up with. Remember you don't have to write it can be anything for example a recipe for "Carrot Cake Like The Way I Do". I really hope you take part, I can't wait to see what you all come up with.